Designed with your organization in mind. Donorhut integrates with Stripe which enables you to accept: Visa, MasterCard, Amex, Discover, Diners Club and JCB. Accept whichever currency works best for your organization. Donorhut works with Stripe who accepts many different currencies. Your campaign can be branded with your organization's logo and a custom campaign banner image. Easily select a color theme for your campaign that best matches your organization and branding. Create a customized donation thank you message from your organization to your campaign contributors. 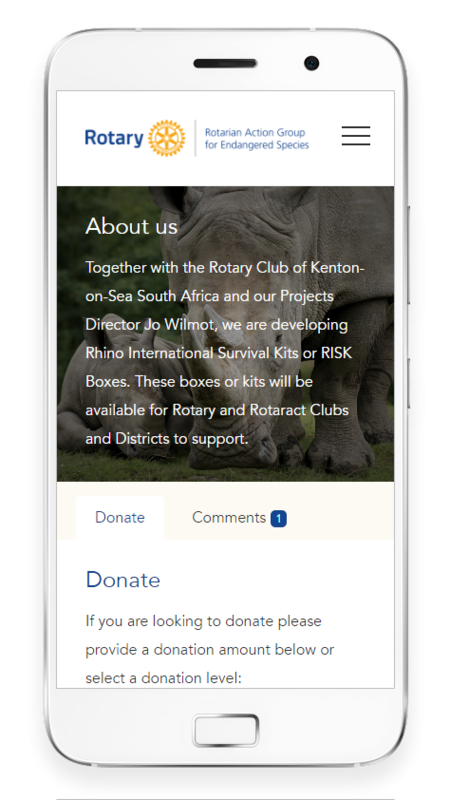 Write an introduction and upload a background image to provide your donors with more information about your cause and goals. Easily view and track the success of your campaign in your Donorhut Control panel. Integrate your Facebook page into your campaign with the use of the Facebook Comments module. Set a goal for your campaign to show your contributors how close you are to meeting your funding requirements. Create a community for your campaign and fundraising by automatically listing opt-in recent donors on your campaign page. Your hosted Donorhut campaign and customer details are protected by the latest security measures and an SSL certificate. Your campaign will work on all desktop, mobile and tablet devices as well as all operating systems. The vital campaign transaction and confirmation emails are sent by premium email delivery provider SendGrid. Get access to the Donorhut cloud fundraising software which makes management of your campaigns easy and hassle free. There is no middle man. All donations processed through your campaign are directly deposited into your bank account. Donorhut is a cloud web app that allows you to update and manage your campaign from anywhere in the world and on any device. Your donors, your data. Export your all of your donor data in one click and import it directly into any other platform or software application. Use your legally registered charity status to collect the necessary tax information to meet governmental requirements for charity tax receipts. Your campaign automatically integrates with major social media platforms to help encourage your supporters to share your cause. Connect your campaign to all major social media networks to increase exposure and encourage sharing. When you request an export of your Donorhut data, we securely send your file (over HTTPS). The export format is the widely supported CSV (comma-separated value) which can be imported into many popular third-party software platforms, including your fundraising, charity or crowdfunding newsletter! Donorhut is a cloud fundraising platform that works on all desktop, tablet and smart phone devices. Donorhut integrates with payment processor Stripe. If you are not a Stripe member yet, registration is quick and simple and allows you to accept payments from all of the major credit cards safely and securely online. Learn more about Stripe. Amazon operates the largest cloud network in the world and Donorhut utilizes the power of Amazon's vast cloud network to store and deliver all campaign files. We understand that your campaign needs to load quickly and always be available, with Amazon, Donorhut is able to provide a higher degree of reliability, availability and speed. Donorhut integrates with premium email delivery service SendGrid. We understand that delivery of donation receipts and confirmations are important. Integration with SendGrid ensures all donation confirmations and transaction emails are delivered to the inboxes of your donors at no additional cost to you. Donorhut integrates with the leading security provider Comodo. We understand that the security of your donors payment information is very important. With Comodo SSL all transmissions from Donorhut to outside servers are encrypted with 256-bit encryption. This helps to prevent any unauthorized party from intercepting the personal information of your donors. Donorhut is a certified partner of Cloudflare, the world's leading DNS (Domain Name Server) and CDN (Content Delivery Network). Through our partnership with Cloudflare we can reliabily deliever your campaign and it's content to your global network of supporters.